In its lower reaches, the San Juan River enters a geological wonderland, wending around the famous Goosenecks of the San Juan, diving into the bottom of an imposing, deep canyon. Off the river, the canyon invites you to explore historic sites such as an abandoned mining outpost and a vertiginous prospector's trail. Natural wonders, fossils, and secret, fern-draped pools await up the many side canyons. Government Rapid is the class III whitewater highlight of the trip, but other class I and II rapids provide ample opportunity for inflatable kayaking. Your adventure begins in the small town of Mexican Hat, Utah, where the river flows northwest through the Goosenecks State Park and into the lower canyon of the San Juan River. Traversing the western slope of the Monument Upwarp, the river cuts deep into a rainbow of sedimentary rocks on its journey toward Lake Powell. Take out at Clay Hills, 56 river miles downstream of where you began. 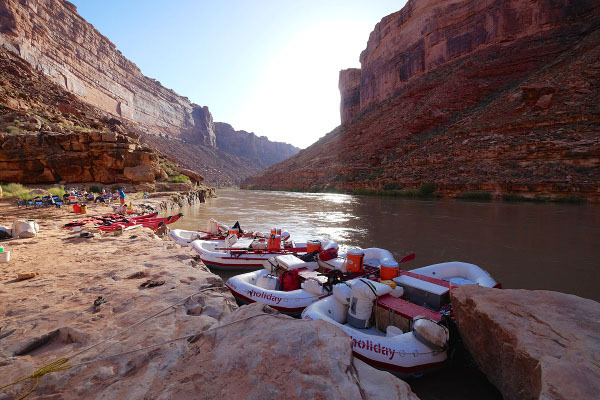 One of the advantages of our San Juan River trip is the flexibility of the daily itinerary. 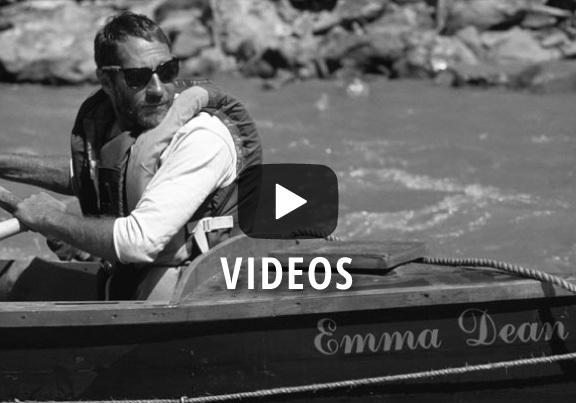 It can vary widely from one trip to the next based on group desires, seasonal water flows, weather, campsite availability, and courtesy for other groups on the river. 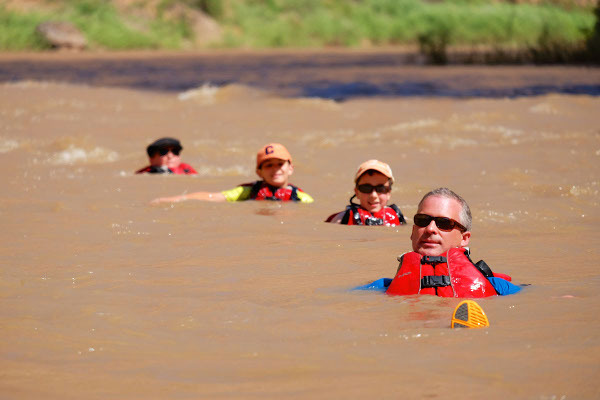 This sample itinerary illustrates a 4-day trip on the San Juan River. For specifics about your trip, please ask your reservationist. Day 1: Your rafting adventure on the San Juan River begins with the group meeting in Blanding, Utah, at 7 a.m. Mountain Time. From there, it's a one-hour scenic ride to the put-in near the small town of Mexican Hat, Utah. Our first stop on the river could be an optional hike to the cabin built in 1894 by prospector Walter Mendenhall, one of many whose dreams of riches were dashed by the San Juan. 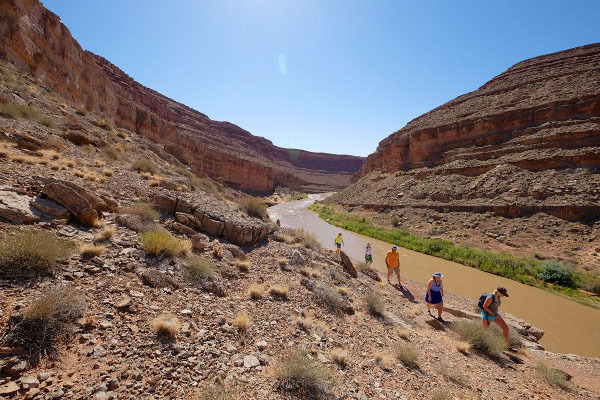 We'll descend into the famed Goosenecks of the San Juan, watching for the great blue herons that seem to lead the way into the labyrinth. Day 2: Start the day with an invigorating hike along the Honaker Trail, a relic of the 1892 gold rush. The reward for those who put forth this 1200-foot vertical effort is an unforgettable view of Monument Valley. 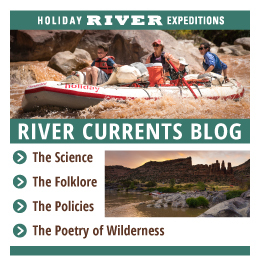 We'll push off into the swift current and meander along with the river through the layered canyon rocks, play in good, clean mud, and run through Ross Rapid. Day 3: Today we'll watch out for the Government Bird Rock, perched on the canyon wall, our signal that Government Rapid is approaching. Later in the day we'll wander up Slickhorn Gulch to a hidden grotto and swimming hole. Make certain to scrub off in the river before hiking to the pool—sunscreen and other chemicals on our skin disrupt the fragile ecosystem of the freshwater pool.We'll make camp and enjoy one last river dinner at the mouth of one of the iconic side canyons along the lower river. 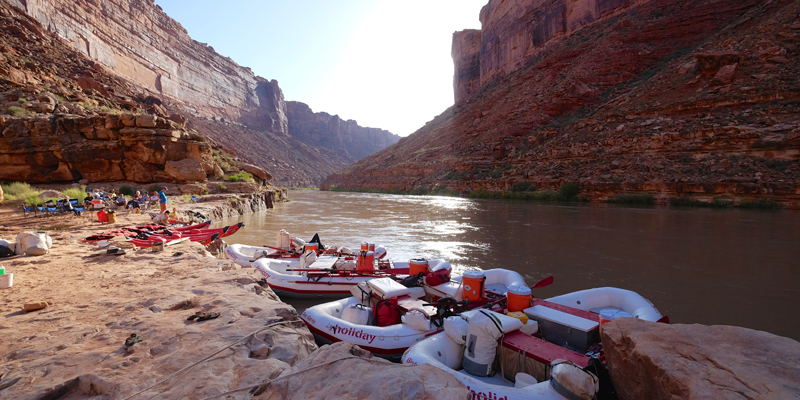 Day 4: Golden morning light reflecting on sandstone walls will usher us downstream, past Oljeto Wash and into the sandbar-studded upper reaches of Lake Powell. We'll dodge and weave our way to the take out at Clay Hills Crossing, soaking up the last precious moments of river time. We'll load up the boats and gear and our vans will carry you the final two hours back to Blanding, Utah. Our expected time of arrival in Blanding is between 4:00 and 5:00 p.m.. Please keep in mind that this is a sample itinerary and should not be thought of as the exact trip you will experience. It is intended to give an idea of what the trip will be like. It could also be exactly what you do. Keep an open mind, be flexible, go with the flow, and enjoy! Food was terrific and they even had a cake for my husband’s birthday. Fantastic guides, scenery and a wonderful family trip. Happy to see not much has changed 20 years later. A definite must for your bucket list. The vegan food was freakin' amazing!!! Thank you, thank you, thank you :) The guides ROCKED (knowledgeable, responsible, and fun) and transportation was excellent (clean and punctual). All in all, the trip was incredible. Thanks! Our San Juan trip was incredible. The guides took excellent care of us and attended to every one of our needs.